Having the opportunity to participate in such classes may help medical students reflect and see more clearly, perhaps providing better care for your future patients. The Association of American Medical Colleges recently had a forum to discuss the arts and humanities in medical education, and the benefits they bring. 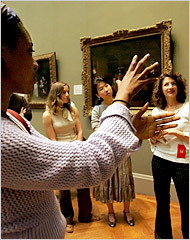 And finally, another article extols the benefits of art in medical education. This entry was posted in Art in Medical Education and tagged art in medical education, Columbia Medical School, med students study art. Bookmark the permalink.